[Ghanaian Chronicle]The Central University College (CUC) has plans to establish a contemporary 500-bed teaching hospital to enhance teaching in its School of Applied Sciences, which will ultimately lead to the establishment of a School of Medical Sciences on its Miotso campus. [Ghanaian Chronicle]Concerned about the plight of the blind, some individuals and corporate entities have donated over 150 white canes to the Ghana Blind Union (GBU), to be distributed to their members. [Daily Trust]World Bank has ranked Nigeria behind Ghana, South Africa and Mauritius in its 2013 doing business report released yesterday. [Capital FM]Nairobi -The government is planning to launch a new health scheme dubbed the Indigent Fund that will target nine million Kenyans who live below the poverty line. [Ghanaian Chronicle]True to the pre-event hype, the Miss Ghana 2012 Street Fashion Show held on Saturday evening, rocked the Osu Oxford Street and its surroundings. [Ghanaian Chronicle]The President of GREDA, members of Council, members of GREDA, members of the media, invited guests, distinguished ladies and gentlemen, fellow Ghanaians. Thank you very much for coming in your numbers in response to my invitation, for this opportunity to address the subject of housing, one of the biggest problems that face our nation and which, I believe, should influence the decision we make on December 7 as we go to the polls to elect a President to manage our affairs for the next four years. [Ghanaian Chronicle]My life was utterly changed at the age of eight when I was sent to school - a journey that saw me abroad for further and higher education. This precious education meant I could return to my country and support efforts to improve the lives of future generations and make meaningful contribution to development process all over the continent of Africa. [Ghanaian Chronicle]The case for state-funded second cycle education has always been the clarion call of the masses. The success of the northern experiment started by Dr. Kwame Nkrumah, the first President of the Republic of Ghana, makes a strong case for the exercise to be extended to all the 10 regions of Ghana. [Ghanaian Chronicle]Tongo -A graduate teacher at the Bolgatanga Technical Institute, Mr. Edward Awunnore, has been confirmed District Chief Executive for the Talensi in the Upper East Region. [Ghanaian Chronicle]The opposition New Patriotic Party (NPP) parliamentary candidate for Cape Coast South, Alfred George Kojo Thompson, has stated categorically that Ghana's economy would see rapid transformation under the leadership of Nana Addo Dankwa Akufo Addo, when given the mandate in the December general elections. [Ghanaian Chronicle]Members of Parliament (MPs) yesterday lost their temper over the conduct of the Minister for Finance and Economic Planning, Dr. Kwabena Duffour, who though, was supposed to lay a loan agreement, came to the House very late. [Ghanaian Chronicle]Vodafone Ghana, the second largest telecom operator in the country has been dragged to an Accra High Court by some dismissed workers of the company. [Ghanaian Chronicle]Last week, President John Mahama had an Evening Encounter at the IEA. It was the first appearance at the event by a sitting President and for that, he deserves commendation. [Ghanaian Chronicle]Kumasi -THE ASHANTI Regional Police Command has arrested four armed robbers who attempted robbing their victims on two different occasions in the Kumasi Metropolis, over the weekend. [Ghanaian Chronicle]NINE banks in Ghana have integrated their information technologies (TIs) to enable them accept one another's Automated Teller Machines (ATM) cards as a way of facilitating business transactions in the country. [Ghanaian Chronicle]Artisans at the Kokompe Light Industrial area in Takoradi have again, expressed worry about how the contractor working on the road network in the area has been executing the project. 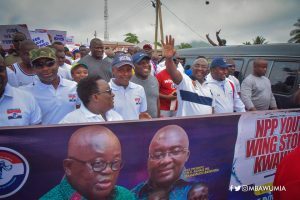 [Ghanaian Chronicle]Dr. Mahamudu Bawumia, running mate to Nana Akufo-Addo, says the ruling National Democratic Congress, led by President John Dramani Mahama has shown inconsistency and is constantly shifting its position on the NPP's pledge of making secondary school education free. [Ghanaian Chronicle]Greater Heights (GH), a major programme on the calendar of Christ Cares Ministries International (CCMI), which has been adored and celebrated by believers from far and near, is yet to witness another celebration.